In today’s Affordable Care Act (ACA) era, institutions must carefully weigh every technology investment. In their quest for higher value and ROI, many are rediscovering the unsurpassed cost-benefit ratio of diagnostic ultrasound among imaging modalities. No wonder ultrasound is recapturing the interest of all those who review healthcare technology purchases. Many constituents have a stake in any health care technology purchase and how equipment performs once installed. With ultrasound imaging, the interested parties include radiologists, sonographers, IT managers, patients and healthcare executives. Delivering unprecedented excellence and professionalism in end-to-end ultrasound delivery. Improving workflow efficiency, operational ease and job satisfaction. 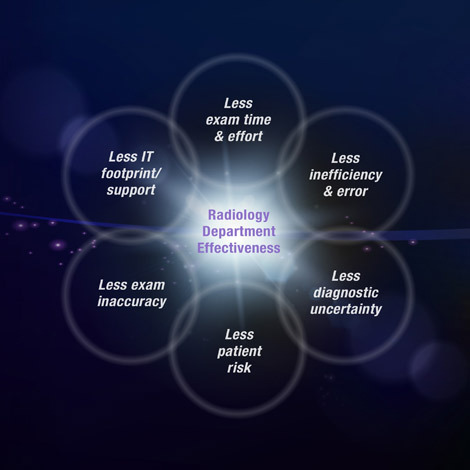 Helping radiology departments manage time, costs and resources to operate more effectively. Seamlessly connecting existing radiology enterprise technologies to enhance workflow—with minimal impact on time, cost and space.